Opinion: Justin McGuirk argues that despite the furniture industry's decline in Italy, it's still the best place to buy a sofa until the digital manufacturing revolution delivers on its promises. Back in the days when I used to edit a design magazine, we rarely published the price of a product. It wasn't that we were embarrassed, or that we thought it was vulgar, we just weren't particularly interested. The magazine was about creativity and innovation, not shopping. There are times though, when talking about money can be clarifying. I encountered one of those moments watching a video on the Guardian's website recently about an "open source" furniture initiative. The designers, from a collaborative group called OpenDesk, demonstrated how you could download their design for a child's stool and have it CNC milled out of plywood. It was a tight little production and everyone said their lines on cue: the journalist claimed it heralded a potential "revolution", and the designers used the words "customised", "disruptive" and "social process". We'll come to those terms in a minute but, first, how much would it cost you to make that child’s stool? To find out, I downloaded the drawings and sent them to a CNC milling company for a quote. In return, I received a professional breakdown covering the cost of a standard sheet of 18mm birch plywood (£54), the CNC cutting (£98) and delivery (£18). That comes to a grand total of £170. But ideally you would use a better, furniture-grade plywood of the kind less likely to leave splinters in the infant's backside, which would easily take the cost over £200. For a child's stool. Made of plywood. Price is always relative, but most readers would probably agree that that is a pretty hefty bill just so you can say that your tiny stool is a piece of "open" design. For that money, you could buy 25 Frosta stools from Ikea (£8 a piece for what is essentially a knockoff Aalto number) or you could take your pick from one of the fancy design shops on, say, London's Upper Street. Now, I appreciate that the first of those options is anathema to the very notion of open-source design: to boost the profits of a global corporation mass-producing disposable products reliant on cheap labour in the developing world, then shipping them thousands of miles and hawking them out of big-box, gas-guzzling suburbia? Come on, man, join the digital era – those days are over! All right, then what about the second option? 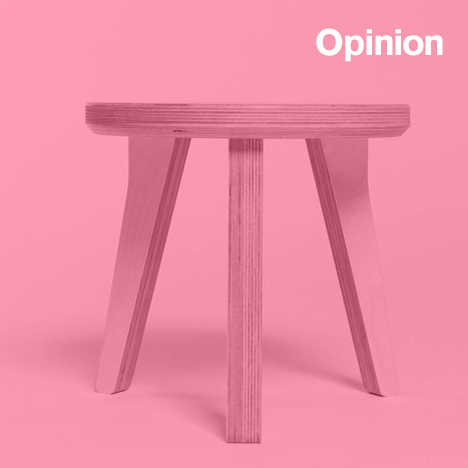 With £200 in my pocket I might prefer to go to a design store and pick out a stool made of hand-turned wood, with a rounded profile and a hand-polished finish – something that doesn’t look like a paper cut-out. Because that is what all open-source furniture resembles, unavoidably, since it is designed to be computer-cut out of flat sheets of plywood and slotted together. The economic argument aside, open-source furniture will not be truly "disruptive" until it produces its first compelling object. Lest I sound like some kind of reactionary, I do believe that open-source design heralds a potential revolution. And I stand behind many of its principles. You want to replace globalised mass production with local, distributed production? I'm with you. You want to make your designs accessible to all? I applaud you. But for the time being the economics don't make sense. And it's hardly OpenDesk's fault. I've played this game before. I once had a wardrobe made to a design by arguably the godfather of open-source furniture, Enzo Mari – one of the famous Autopregettazione series of 1974. I know, I know, I was supposed to nail those planks together myself but, anyway, the materials alone cost a small fortune. That is the problem with not having the economies of scale on your side. Even Artek, which put one of his Autopregettazione chairs into production – going against the very principle of Mari's concept – couldn’t get the price below £250. I also get that, in theory, we have crossed some invisible line beyond which we are supposed to have superseded the individual genius, the alluring object and the consumer, replacing them with the network, the system and the participant. But of this I'm less certain. I still find Mari's planks more assertive than almost any open-source, CNC-cut plywood. And what's more, despite the talk of "customisation" and "social process", even I, who am ready, willing and (fairly) able wouldn't know how to begin customising that stool – I don't even have the software. And even if I wanted to take the train to that CNC cutter in Essex, there's nothing particularly "social" about watching a machine drill through plywood to some algorithmic configuration. I know the moment will come when everything written here will look churlish and shortsighted. But the problem is that we are not in the midst of a revolution, we are in between revolutions. Open-source design is still far from delivering on its promise, and yet the traditional furniture industry is in decline. Having spent years critiquing, even lampooning, Italian design and "Made in Italy" – a world of octogenarian maestri, protectionism and lizard-lounge styling – I now feel some nostalgia for it. "It's hard to find a good lamp," Donald Judd once complained. Well, let me tell you Donald, it's even harder to find a good sofa. And when we needed one last year, where did we find one that was not too ugly (despite sofas' inherent ugliness) or too expensive (despite their inherent expense)? That’s right, Italy. Somehow, that bastion of post-war design values – of craftsmanship combined with industry – still seemed to be the place offering a few options that were well made and comfortable without looking too ridiculous or costing the same as a BMW. True, we probably could have downloaded a design and had it cut out of plywood, but our behinds prefer something less… disruptive.